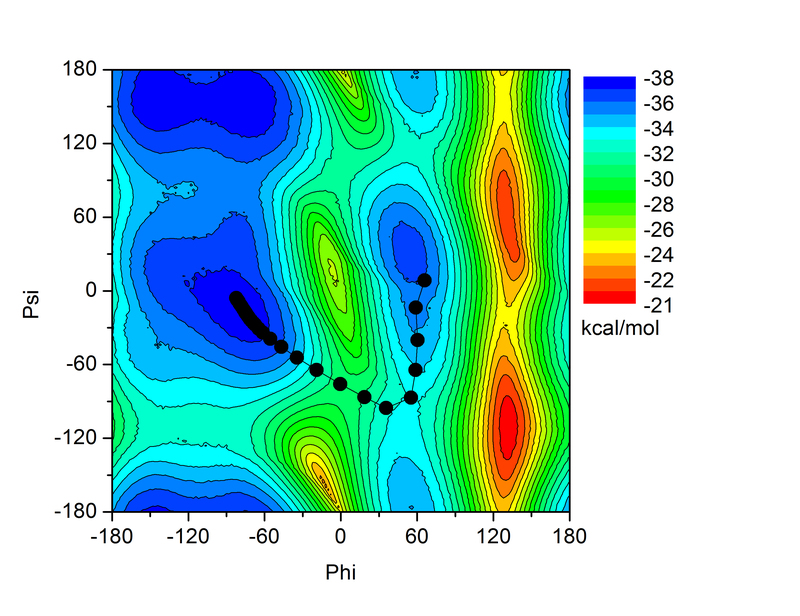 Potential Energy Scan for Phi/Psi Rotation of Alanine Dipeptide. Dots show path found by Nudged Elastic Band (NEB) method. represented by the amber force field. This tutorial will show you how to use a simulated annealing version of Nudged Elastic Band (NEB) to locate a low energy transition pathway for the Phi-Psi isomerization of alanine dipeptide. The use of simulated annealing means that it is not necessary to provide an initial guess at the pathway, merely the end points will do. Secondly using simulated annealing means that the algorithm will not remain trapped in the local minimum.